In 2009, my research team here at Forrester published a report on what we called "smart computing," a new generation of hardware, software, and networks that connects physical infrastructure with analytic computing systems. Next month we will publish an update to that research, outlining why we continue to think that smart is the next wave of IT industry growth, likely to outstrip cloud and mobile computing in its eventual impact. We believe that smart computing — sensors, M2M networks, and analytics, along with collaboration tools — will be as transformative of business in the coming decade as the Internet and Web browsers were during the 1990s. Improving transactional processes is yesterday's story. The back-office challenges of preparing financial statements, fulfilling customer orders, or tracking inventory are well addressed by enterprise and personal productivity software. These traditional workloads are migrating to cloud computing resources in some cases, but are not creating incremental technology investments nor opportunities to transform how a business operates. Optimizing assets is the next important challenge. Especially in service-based industries, favorable economics result from building an asset base and then selling access to those assets in the form of services. Managing and optimizing the use of those assets — physical, human, financial, and intangible — is the source of revenue growth and improved margins. Smart computing systems provide the awareness, analytics, and actions required to improve the utilization of a firm's assets. And in most cases, these systems represent incremental investments in computing resource, with the payback coming in the form of more efficient, more highly utilized, and therefore more profitable assets. Smart flexes to meet industry-specific challenges. Each industry has a different mix of assets with different optimization opportunities. In high-tech, development and channel resources must be marshaled in the face of accelerating development cycles, long supply chains, and unpredictable consumer tastes. In finance, mountains of data must be sifted to find the best investment opportunities, while managing market and compliance risk and keeping employees productive. Finding the right mix of online and brick-and-mortar, the right product portfolio, and lean inventories are paramount for retail execs. 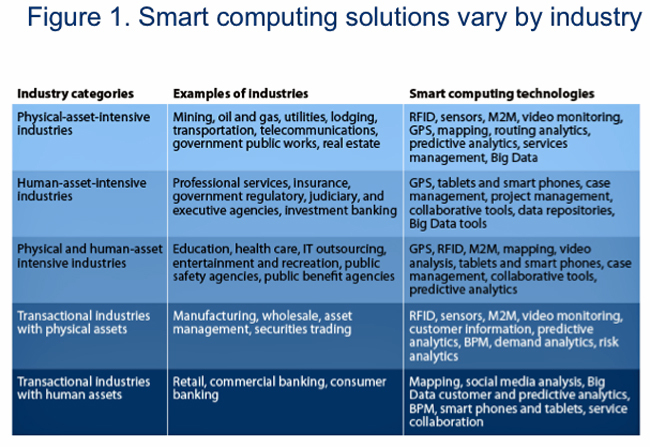 The right portfolio of smart computing solutions will vary widely across these and other industries (see chart below). While smart computing does not receive nearly the attention devoted to the cloud, we see some evidence in our enterprise surveys that they have plans for significant investments in at least some of the component technologies that comprise smart computing solutions. Looking at 2012 implementation plans, we see that process management software ranks No. 3 and predictive analytics No. 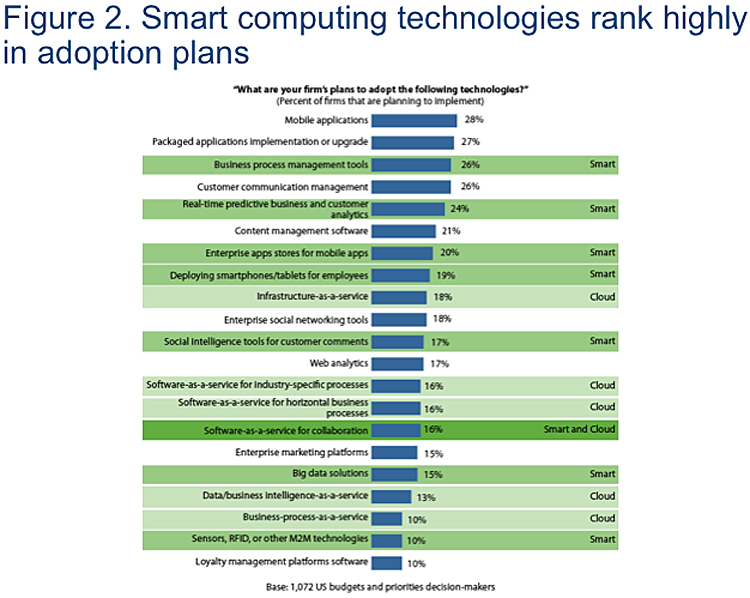 5, with other smart computing technologies sprinkled further down the list (see chart below). We have done further analysis of these implementation plans by industry, finding that, for example, manufacturing firms are more likely to be investing in M2M technologies, retailers in analytics capabilities, and financial services firms in process management. The growing adoption of smart computing will be one of the drivers of continued economic out-performance by the tech industry in 2012. By our reckoning, U.S. GDP will grow by about 4 percent this year in nominal terms, while total domestic IT purchases will grow by 7.5 percent. That market growth will be paced by software spending increasing by 11 percent+, accompanied by 8-9 percent growth in spending on consulting and systems integration services. The connection of physical assets with computing and analytic systems has big implications for corporate sustainability, as we have written about regularly in this space. This week at GreenBiz's VERGE conference, I am hosting a panel on energy and emissions management featuring sustainability managers from Avaya, Deloitte, and Dow Chemical. We'll be talking about how they are using IT systems to set, monitor, and improve their firms' sustainability profile, both in internal operations and external product and service delivery. If we don't see you there, please engage via the comments section below.